I’ve noticed that people are fed up with celery because they simply don’t know what to do with it. It’s that one vegetable that’s great for dipping in sauces or creating little peanut butter boat snacks for kids. Other than that, many of us scratch our head thinking how the heck we can eat it. To help you make more use out of your celery, I created a dairy-free cream of celery soup recipe! I’m also the type of person that eats soup all year round when I feel like I need to cleanse myself of heavy foods (I go on mini soup cleanses seasonally). With soups I can be creative with my recipes and really blend together all sorts of veggies and fruits to create nutrient dense concoctions! I absolutely love making soup in bulk (I mean, just take a peek at all my soup recipes) This time, celery is the star of my soup show. If you’re thinking well I don’t even think celery has a taste, you’re wrong! When blended with seasonings its flavor profile is light, pleasant and perfect for warm weather. I especially love this soup recipe because celery is low in calories, and the entire soup recipe is gluten-free, dairy-free, and low sodium. Pretty much all of the “free of” ingredients that we look for when eating balanced. Oh and if you love cream based soups without the dairy, you’ll also love this dairy-free cream of broccoli soup. 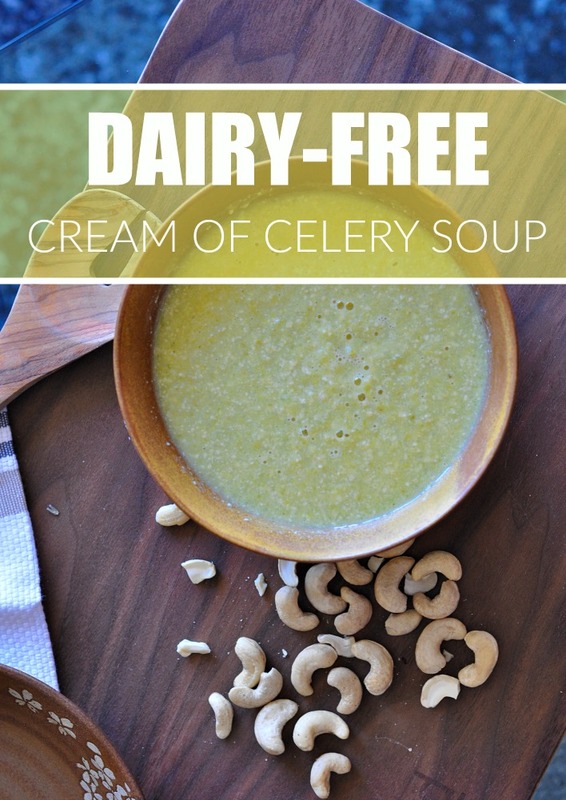 This dairy-free cream of celery soup is easy to make in bulk for weekly meal prep, it has two steps (boiling + blending), and is nutrient dense to your heart’s content. Let’s break down the nutritional benefits shall we? 1: One cup of celery contains 37% DV (daily value) of Vitamin K, and 9% DV of Vitamin A and Folate. 2: Celery contains antioxidants that help lower inflammation, and a compound that acts as a natural diuretic that helps the body to detox. 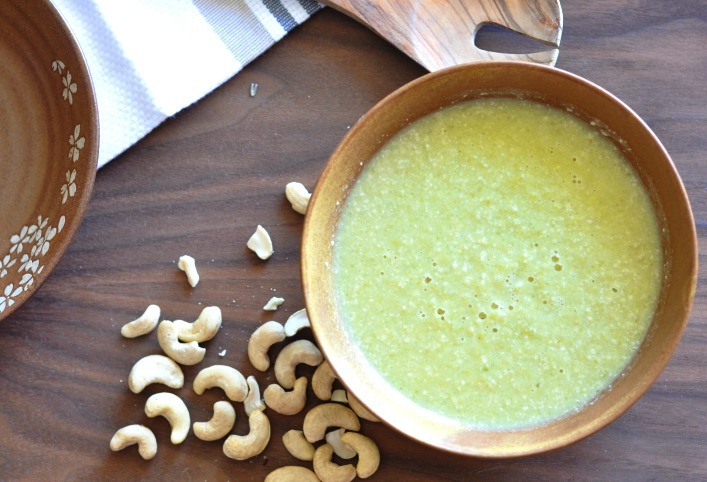 3: You’ll be getting a dose of healthy fats from the cashews in this recipe. Cashews have the same type of healthy fat as olive oil! Once all of your soup is blended, transfer back to the soup pan and serve! Important notes: If you want to water down the soup even more, add more water to the blender or food processor. Adding nutritional yeast will give the soup a nice nutty flavor. Blending the soup in batches will be easier than trying to blend all of the soup at once. You can serve chilled or warm! Next ArticleNutritional Yeast: What The Flip Is It?! This was absolutely delicious! I made it in my new soup-maker. Will definitely be making it again. Hooray! So glad you like it! What type of soup-maker do you have? Oh man I'm going to need to get one of those! I spend so much darn time chopping and dicing all my onions - sounds like it's a time saver!